Bring the expertise and passion of BuildingGreen to your next event! 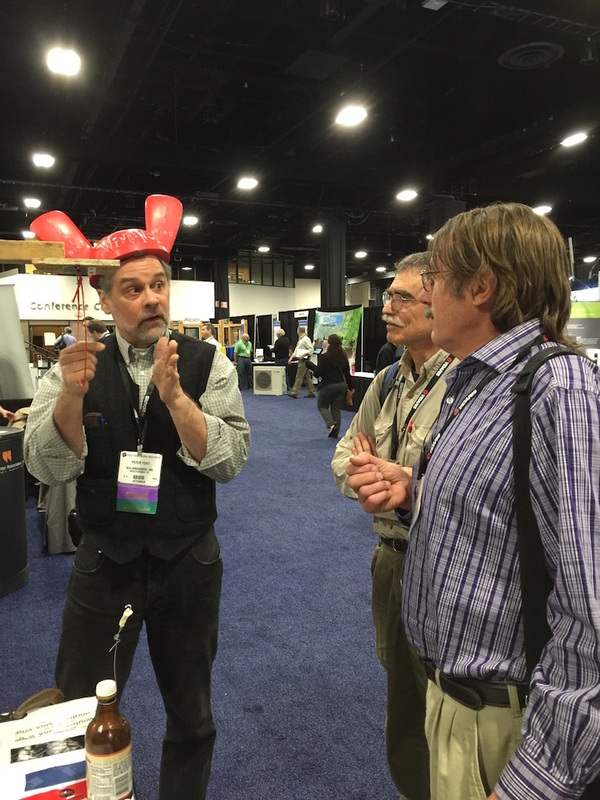 Our appearances are frequently noted as “best of” at large conventions like Greenbuild, Living Future, and the AIA Convention, and our speakers are sought after for leadership events organized by corporations, nonprofits, and trade associations. Flashing tapes are critical to many if not most wall assemblies that are currently being built. Therefore the durability of these pressure-sensitive adhesive (PSA) tapes is critical to the durability of those assemblies. So it may come as a surprise that no one really knows how long they last. That’s why we’ve been field-testing tapes here in Brattleboro, Vermont. (Learn the whole backstory here.) For our latest round of testing, we have been doing what we do best: bending the rules. 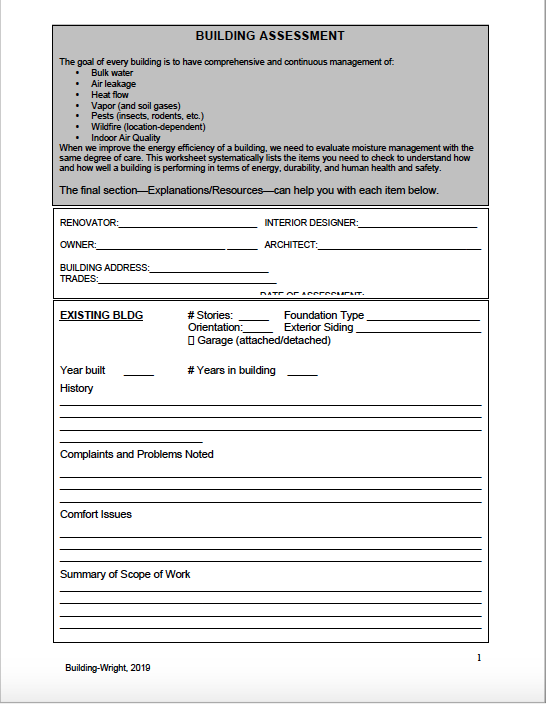 We wanted to know what happens if you install these tapes like a lot of people do on real jobsites: around window openings, on a variety of substrates, and in less-than-ideal conditions. It’s hard to imagine PSA tape conditions tougher than adhering to both rough-side OSB and a window flange (aluminum and PVC). It turns out that only one tape in our testing adhered without fail to everything, even when wetted: ZIP System flashing tape from Huber Engineered Woods. We’ll be the first to say that our testing is anecdotal and suggestive—not conclusive. This is not a takedown of any brand of tape, and we don’t have any financial stake or other interest in the outcomes. BuildingGreen is an independent company that does not run advertising from product manufacturers in its publications. We are, after all … wingnuts. Sample sizes of two are anecdotal, not statistically significant. Our results are contextual, and we ask that you not generalize them. To date, we have been driven by a sort-of PSA “Holy Grail”: one tape that does everything. Our mission statement: cajole adult supervision. 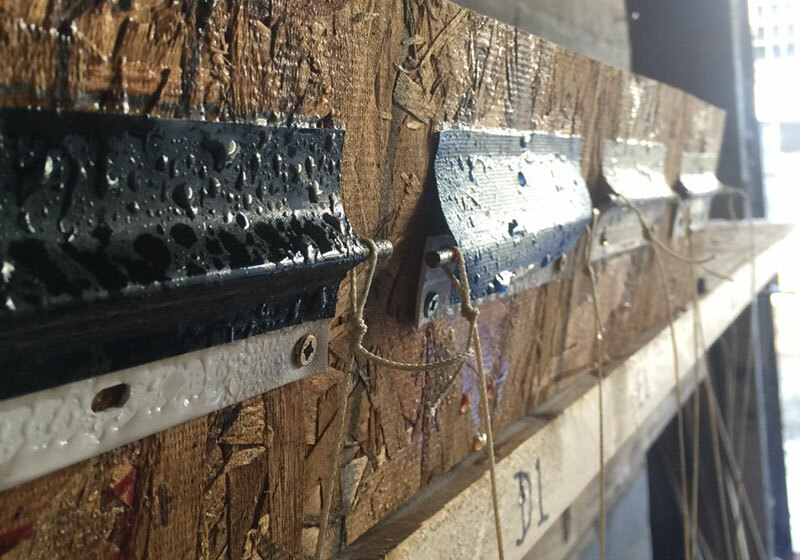 The industry needs to provide data and testing methods that reflect real wall assemblies and real installation conditions. We designed this pressure pig in 2014 to mimic the “bellowing” stress that PSA tapes would see at window openings. (Z)oinks! We realized pretty quickly—even for wingnuts—that we simply don’t have the resources it would take to automate the pressure-pig bellowing test of a whole slew of tapes (see Testing Pressure-Sensitive Tapes: Rounds Two and Three). We needed to devise a much simpler test that approximated the pressure that tapes might see when half the tape is adhered to the wall and the other half to, say, a window flange. And that is when we came up with this rig. We did the math, translating the force of the hanging weight into pressure (Pressure = Force ÷ Area). 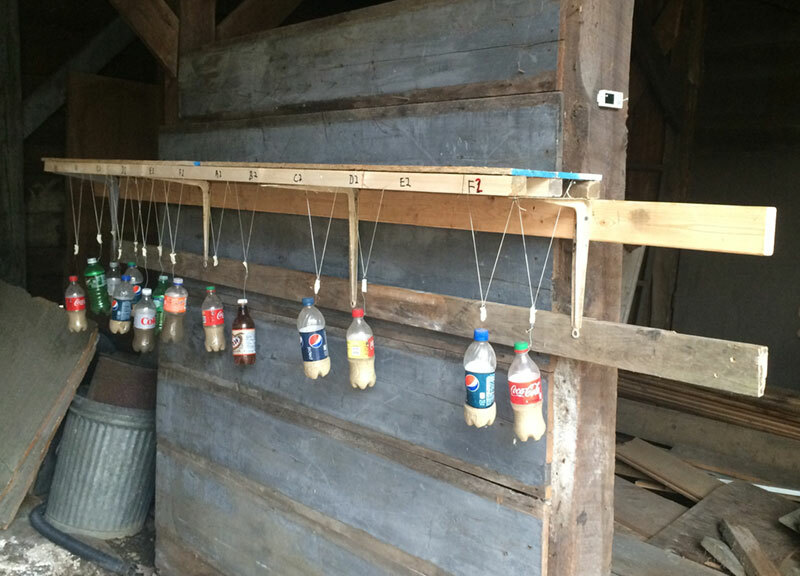 To simulate variable wind pressure, we loaded and unloaded the hanging weight. 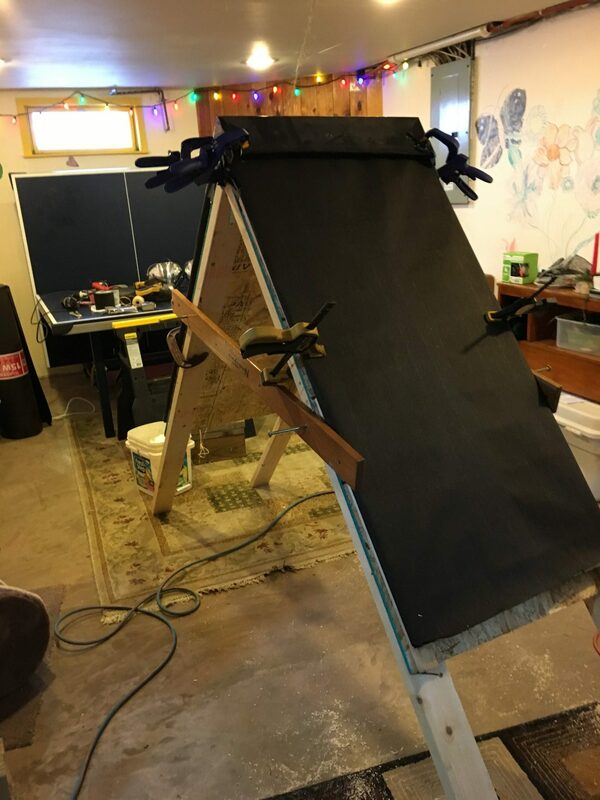 Turns out that one-sixth of a pound is about equal to 75 Pascals of wind pressure, so we decided to make the hanging weight one pound (about 450 Pa or something like an 80 mph wind) to “accelerate” the testing. We wrote up this new WTF “Protocol” to send around to the three primary high-performance PSA tape manufacturers we were testing to see if the protocol passed some kind of muster with them. 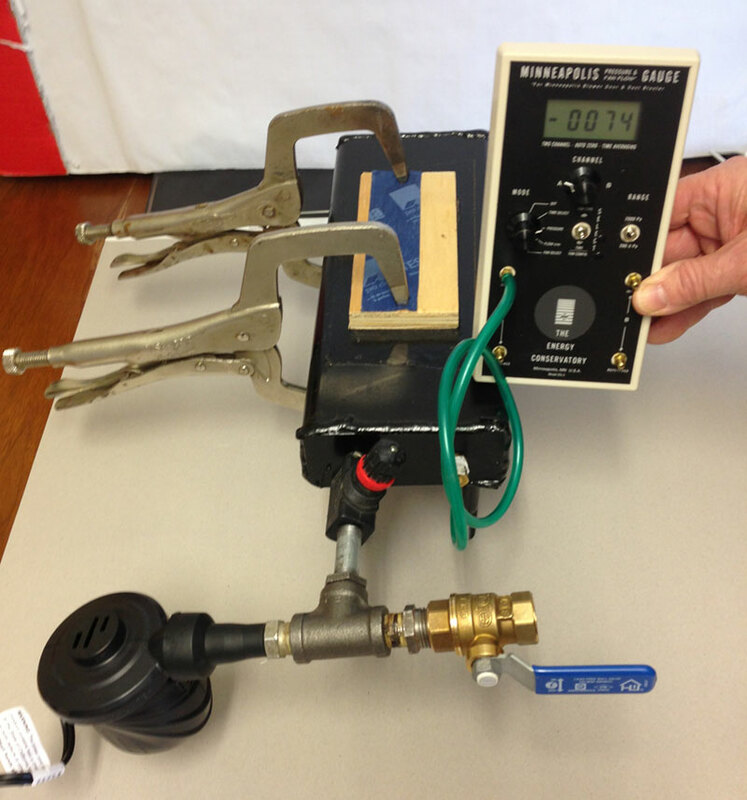 The key to this test rig is the 3/16″ metal bar. 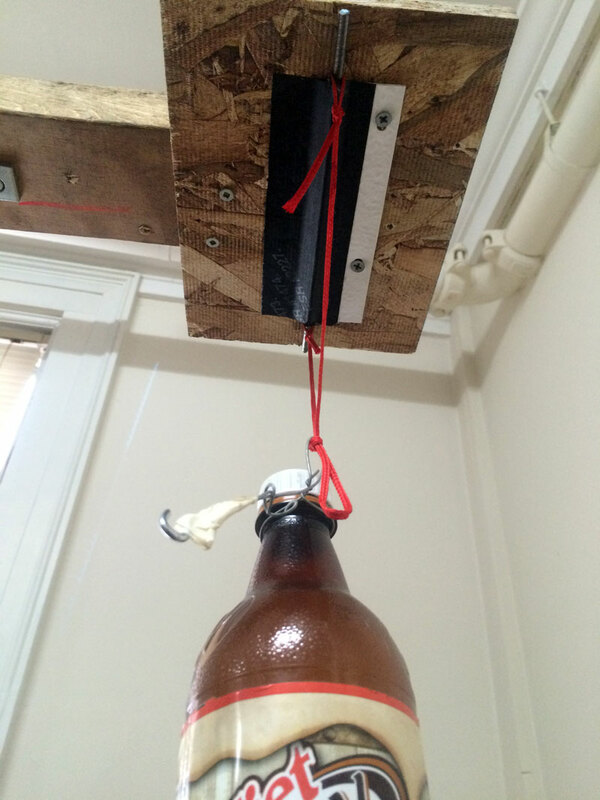 It distributes the one-pound hanging load of the bottle pretty evenly between both halves of the PSA tape—the half adhered to the rough OSB and half adhered to the window flange (in this case, PVC). We set up two samples of each per the test conditions described below. 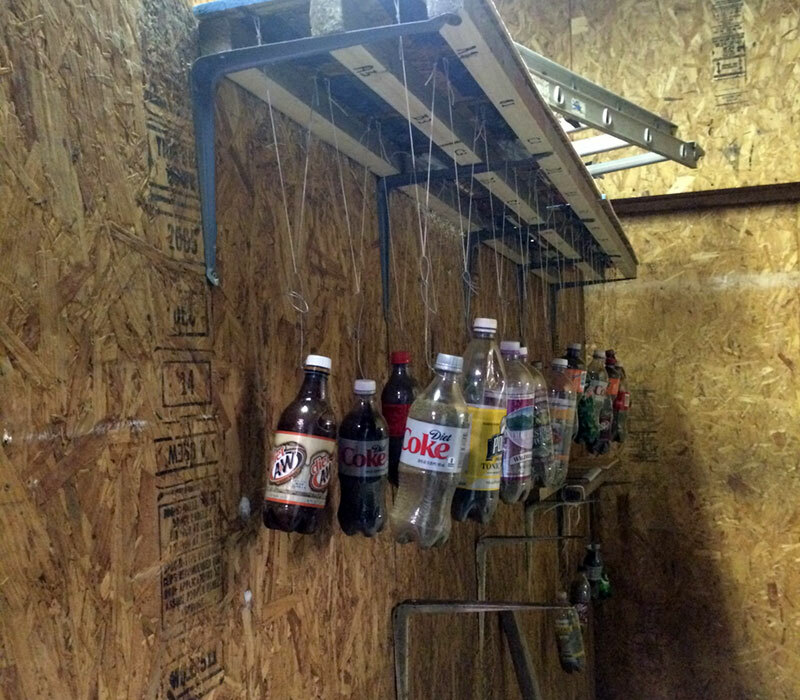 Each bottle weight connects to the string loop with a hook so that all the weights can be easily removed/unloaded. 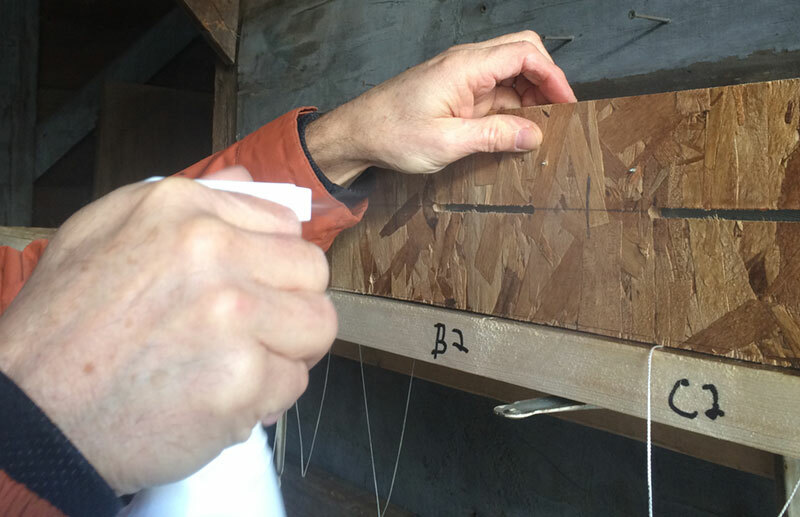 We applied the tapes to the substrates in an unheated workshop in November 2015 (about 40ºF, 40% relative humidity). We started the test in an unheated workshop that proved too sheltered. So we moved to a shed. Though protected from direct wind, sunlight, and rain, the shed area was fully fluctuating with the outdoors in terms of temperature and relative humidity. We periodically wetted the test rigs, front and back, to mimic precipitation getting past the cladding to the tape/flange/OSB. This also mimicked wintertime condensation occurring on the back side of the OSB (each test setup has a rout simulating the gap between the window unit and the framed wall). NOTE: Two samples of each brand of tape were periodically wetted, and two were not. 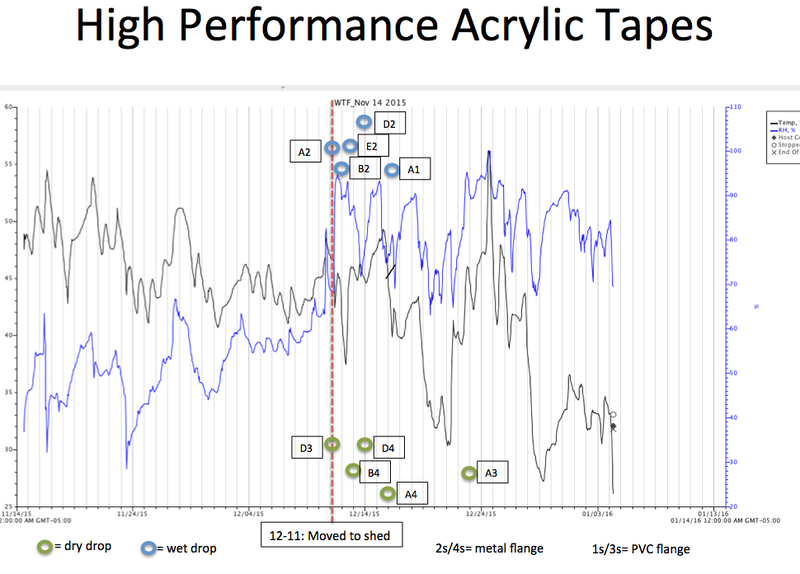 Each tape type was tested on both PVC and aluminum flanges. Here the bottom side of the test setups (representing the front, or cladding side) has been spritzed to simulate water leaking past the cladding. We did not load any tape setups until at least 24 hours after pressure-applying the tape to the substrate. We pressure-applied each tape according to the manufacturer’s installation instructions. One manufacturer (Pro Clima) requires that its primer be used when adhering its exterior tape (Tescon Vana) to rough-side OSB, so we followed these instructions. Table 1 shows the results of our testing as of March 28, 2016. To reiterate, our testing is far from statistically significant; the testing is mainly suggestive, and we would like our testing to lead to more rigorous and extensive testing. All three of these acrylic tapes are aggressive and respond well to tough conditions. But the only tape that adhered without fail (to date)—regardless of wetting and on both aluminum and PVC flanges—is the ZIP System flashing tape from Huber. This table shows all the conditions and dates of drops. Blank cells indicate that through March 28, 2016, the tape is still adhered to the substrate well enough to support the weight when loaded. This shed is leaky (regarding both air and water), with temperature and relative humidity pretty close to that of the true outdoors. Graph 1 shows how all the tapes held until we moved them from the sheltered workshop to the outdoor shed. It shows the temperature in the shed (black line), the % relative humidity (blue line), and the drops (except the latest drop on March 16, 2016 of B3). 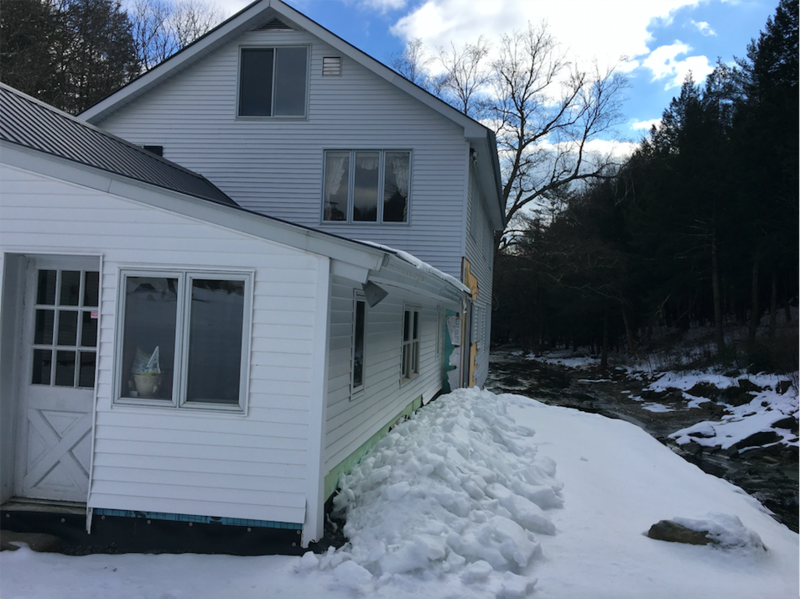 These results surprised me; I was convinced that the European “solid” acrylic tapes would perform better in high-moisture conditions, but at least in our limited testing, ZIP System tape did better, at least to date for winter conditions. In past work adhering Pro Clima Tescon Vana tape with its primer to both rough-side OSB and masonry such as concrete block and brick, the primer and tape could only be separated by essentially ripping apart the substrate of the tape, or both. There was an incredibly strong bond with the primer. Therefore we were surprised that this product did not perform as well in our latest testing. In looking for answers, we think it is possible that when applying the primer to the OSB at 40ºF, we did not allow the primer to “set,” or we applied the primer in too thick a coating to become “tacky” before adhering the tape. 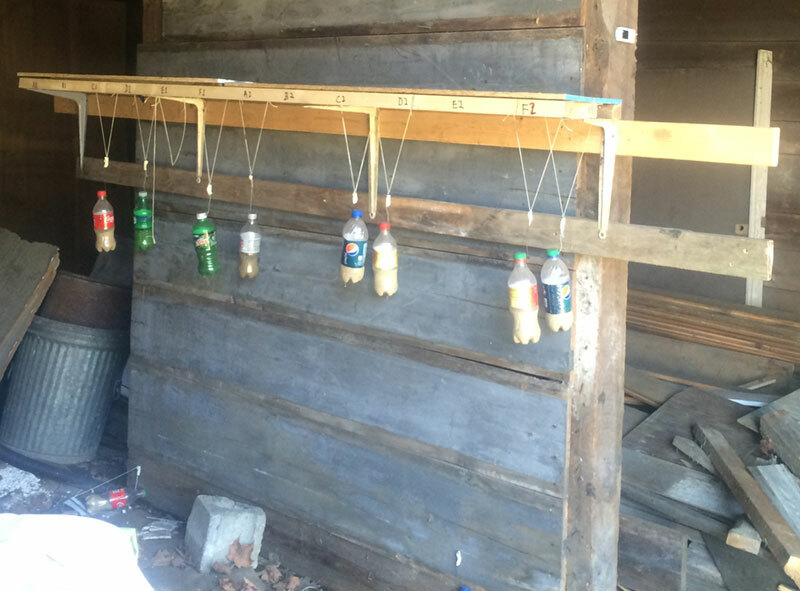 In November 2015, we learned of the Durability Lab run by Building Diagnostics, Inc., affiliated with the JJ Pickle Center at the University of Texas – Austin (http://www.buildingdx.com/services/materials_testing). “We have followed your work in this area with admiration, and would be flattered to work with you in the future,” wrote NiCastro in a December 2015 email. What? Admiration and flattery? Wingnut wonders never cease. Stay tuned as we try to convince NiCastro that WTF should become the “cold-climate partner” for the Durability Lab. Incidentally, I took the following photo in mid-May 2016. There were only eight test samples still hanging in there. All of them were ZIP tape—wet or dry, and on PVC or aluminum window flanges.